There are endless ways to build products that customers love. It is easy to believe that extraordinary individuals design great products using keen insight into customers. However, this opinion is not supported by the success of companies like AirBnB, Ring, and Uber. The founders of these companies spent years refining products to meet the needs and desires of fickle customers. Many believe the myths and rely on "unicorns" to create successful products. A better way might be to use a systematic approach to understanding customer needs. Such a model would test products with customers and provide insights into their behaviors and emotional desires. The keyword being "insights." Why spend enormous amounts of time and capital developing products that nobody will use? This seems illogical. And yet, we continually witness products and services being designed using "expert" knowledge instead of customer feedback. 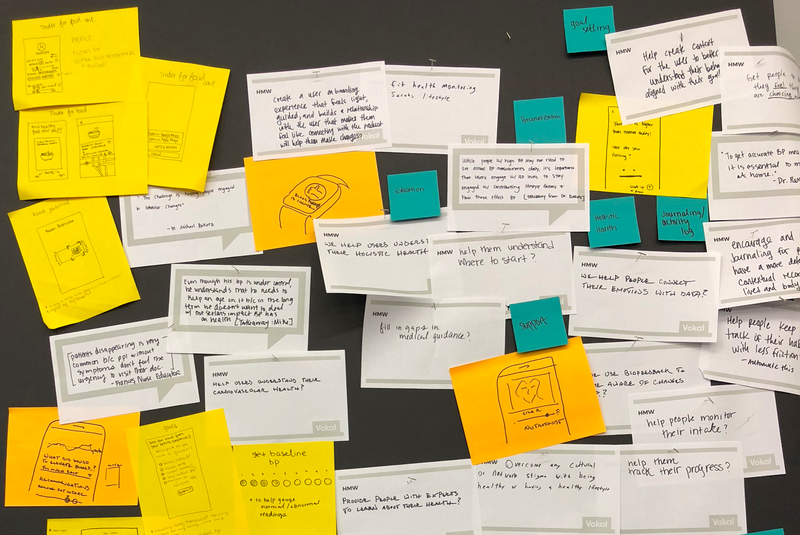 Design sprints, most famously defined by Google Ventures, offer one option for systematically gaining customer insights. 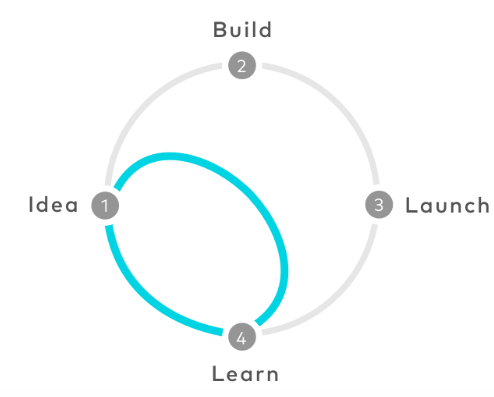 This model ensures that teams both prototype products and engage with customers. Repetitive sprints offer an iterative model for identifying products that customers will use, as well as surfacing future patterns of behavior. Ideally, we not only learn about customers’ needs, but we dig deep into their emotions and desires. You can use design sprints to build great products. At Vokal, we continuously run design sprints to exercise our skills. Constantly learning is critical to both nurturing high-performance teams and building products that customers love. 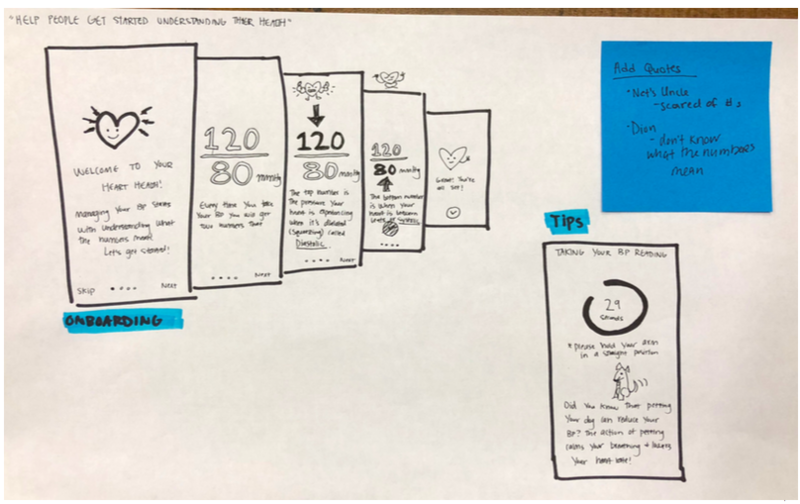 We recently conducted a design sprint to understand the behavior of people concerned with high blood pressure. This article outlines the objectives and simple steps we followed for that project. Design is iterative, and designers are never truly finished designing. Great design requires continual practice, discipline, and exploration. 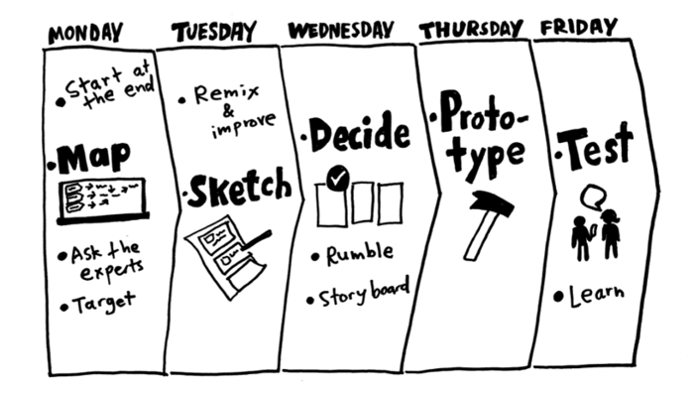 The objective of a design sprint is to learn rapidly, and also time-box the effort. We aim to rapidly acquire feedback from users providing the feedback necessary to improve our ideas. Through iterative sprints, we can see beyond the immediate horizon and identify larger patterns of behavior. Design sprints supplement more considered ethnography, or Design Thinking efforts. Sprints empower teams that have fewer resources for research and need to continuously deliver product. While it is possible to start with a current product, it is often best to begin with a practice topic. In our design sprint, the team focused on a problem area to explore — empowering people with high blood pressure. Since the sprint supported a client pitch, we will not discuss the strategic findings. 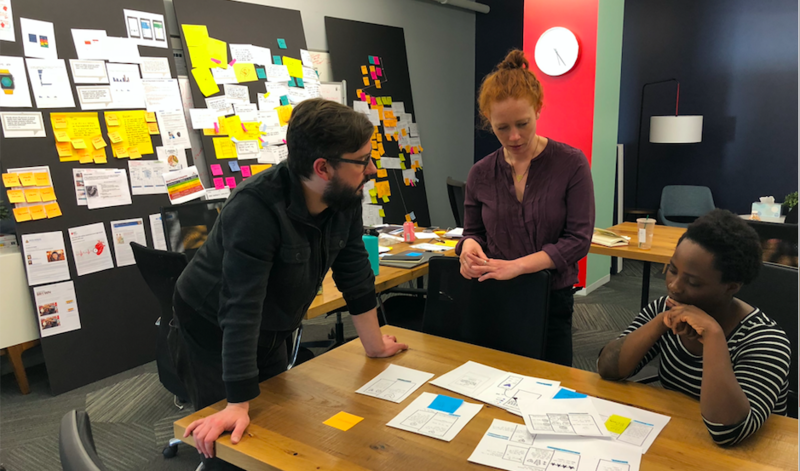 We are now iterating on our initial design sprint in order to define and validate an innovation roadmap, and to develop specific opportunities. Our experience with design sprints has shown that a weekly cadence is aggressive. We stretch the typical one-week schedule to two-week sprints to increase involvement from others with tight schedules. The end result of a design sprint isn’t necessarily a product. It is the insight gained during the process. These insights define an experience which addresses specific business objectives. Google Ventures says, "start at the end." This implies the team must have a clear idea of what outcomes will be impacted by the intended product. As in scientific experiments, we are applying the sprint process to validate whether our design achieves an objective that people hope to accomplish. During the process, we begin to see unexpected patterns and find people doing things differently. The five step process begins with a clear target. STEP 1: FIND OUT EVERYTHING YOU CAN ABOUT THE "PROBLEM"
Human-centered design is a tool for problem solving. The Vokal team began by tackling the problems people face in understanding and managing high-blood pressure. 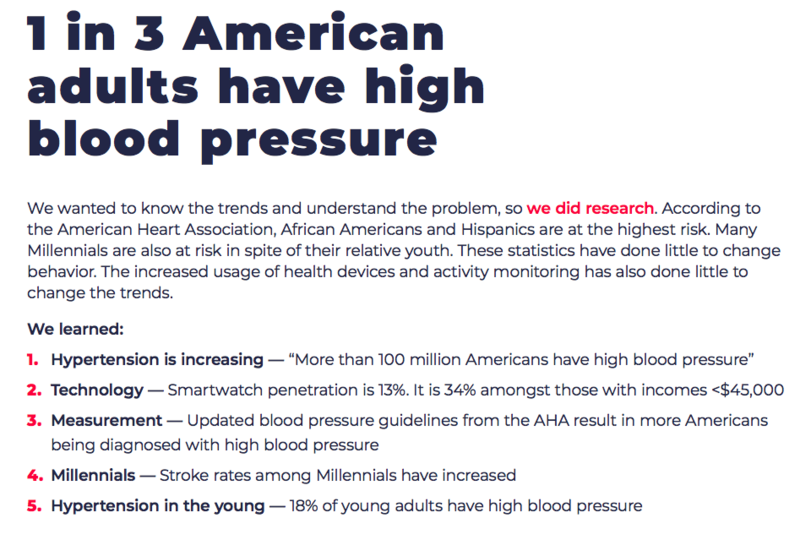 We surfaced trends in blood pressure and wellbeing. We also spoke to healthcare providers and caretakers to learn more about the challenges faced by patients. Primary Research: Talk to people who can influence the problems, such as health experts. Secondary Research: Research the problem through articles and websites. These insights helped us create a picture of people who face the challenges of having high blood pressure. One of our personas was influenced by our secondary research… We also began to understand their health journeys. The next step is to create possible solutions to problems this person may face. Using a journey framework, we created How Might We (HMW) statements which were intended to support our design hypotheses. These HMWs were organized within our themes of Understanding, Goals, Engagement, and Interpreting Data. The HMWs were then prioritized according to how much value they provided to people and how much effort would be required to develop them further. Understanding — HMW help people understand their holistic health? Goals — HMW help create context for people to better understand their behavior and goals? Engagement — HMW help people remain engaged with their health? Interpreting Data — HMW help people interpret their health data? Using the HMWs, we developed numerous concept sketches which supported our most interesting hypotheses. 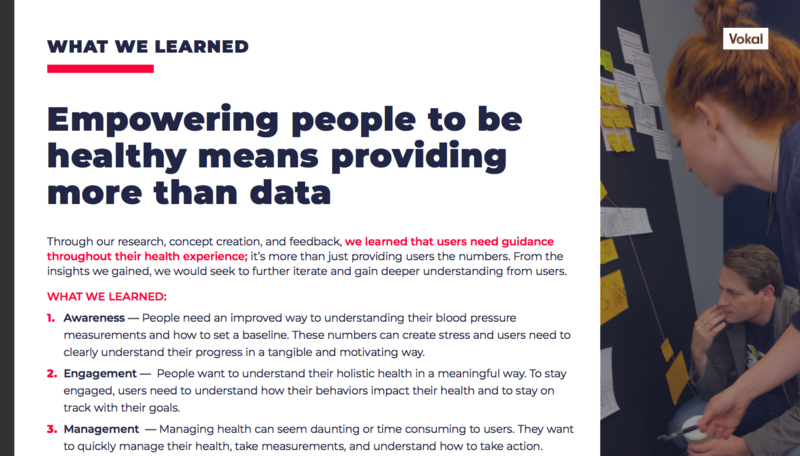 We were sure to have concepts for each part of the journey, so we could explore how people learned about their condition and continued to manage their high blood pressure. A small set of these initial concepts will be selected for further refinement in our next step. We used a simple dot method of voting to select our best representative concepts. These concepts will be presented to potential users, so we need to refine them further to clearly articulate our design intent. Remember that a prototype represents a test of our hypotheses and is designed to spur further conversation. Our goal is to have about 8-12 concepts to explore with potential users of the product. We selected three concepts for each portion of the health journey. These concepts were further developed. A prototype is a communication tool. People with differing learning styles respond to different types of stimuli. Some respond to words. Others respond to pictures. Together words and pictures paint a product landscape that very quickly becomes real in the minds of participants. I am always shocked to see people call prototypes "apps" during our conversations. Our job is to create an environment where people live in a world where their needs are met. In order to explore this world, we build clearly articulated research questions that explore our design hypotheses. Our prototypes are developed in conjunction with these questions. Our next step is to explore these topics with people in the environment where the problems exists. In discussing high blood pressure with people in context, we aim to recognize how they currently understand and manage their high blood pressure. We also want to explore their needs and higher-level desires. How do people become aware of high blood pressure? How do people come to understand their condition? How do people want to manage their health? Through iteration, design sprints can empower designers to rapidly learn from people and apply this learning effectively. It is a useful tool to use both alone, as well as in conjunction with ethnography and contextual research. A design sprint is simply a hybrid between product testing and contextual research. In many environments, finding the resources to research with customers is difficult. These lightweight tools can offer a way to ensure that we are creating products that customers love. Design Sprints require very little to begin except the willingness to fail and learn. There is a systematic way to build products that customers love, and following an iterative, build-as-you-learn process, is an effective way to achieve this goal. Feel free to reach out if you would like to learn more about Vokal's insights into Design Sprints or design process.